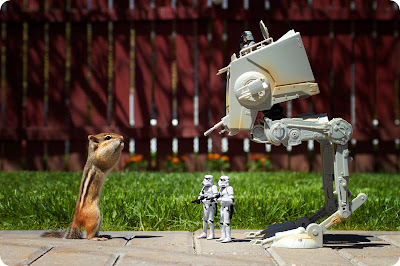 "These are not the nuts you are looking for!...move along." This one goes out and up to all of you college students that are finishing up your finals this week. I pray you can retain and retrieve everything you learned and that you will rock all of your test. Eat well, study hard cause a break is on it's way! WOW, I am sore! I spent Saturday in the woods with our teens playing Capture the flag. It was great! I am sure the poison ivy complaints will be rolling in soon! Then on to Church set-up: Were we had a great turn out and got it knocked out in record time. Somehow we got talked into going from there to get some wings. Sunday started off with a great group of men working on establishing Discovery's eldership. Children's church was a blast as normal! These kids we work with are amazing. I love each and every one of them! We got to learn about God kindness though a grape relay. Then we all go to go to "big church" to watch the baptisms. To end a perfect weekend we met out teens at 6pm for Crosslink and had a blast! We were blessed with 4 visitors! 3 of which we had previously met. With that many, we just had to order pizza! If I haven't told you lately: I love my work!